How many bikes should we bring? This might be the most important question we ask ourselves as fans. 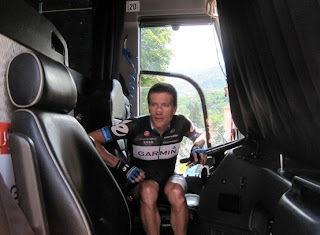 We are going to the USA Pro Cycling Challenge and want to do a little riding ourselves. Should we bring the road bike to get up those mountain passes - yes; should we bring the around town bike to avoid traffic, be able to lock it up, and avoid drinking and driving - you bet. We know we put the camping gear in the car, loaded up the cooler with New Belgium beer, and of course brought the fishing pole so we can go fishing with Jens Voigt, but what if we want to take in some singletrack while on our awesome USPCC Chase the Tour Vacation across Colorado? We are going to need our mountain bikes. ... we are going to need a team bus to haul all our gear! 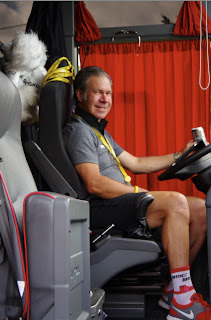 Maybe we can get this guy to drive the bus for us (Jim Ochowicz, manager of team BMC). We have so many knowledgeable adventurers in Colorado, I was able to contact Kevin Swab of Colorado Mountain Biking (www.comtb.com), turns out Kevin is a huge fan of pro cycling. Kevin said, "There's great mountain biking near all of the stages, my site only contains ride descriptions near some of them. I can offer suggestions for other areas though." 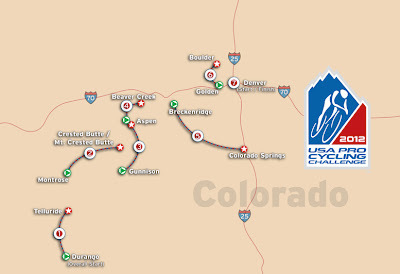 Here are Kevin's personal suggestions on where to mountain bike along the route of the 2012 USA Pro Cycling Challenge. Leadville has lots of old high-altitude mining roads to ride, and there's always the Leadville 100 course. There's more Colorado Trail (CT) sections to ride at various places along the route, and in Beaver Creek, there's lift-assisted riding. Breckenridge has lots of great high-altitude singletrack and mining roads (see the Breck Epic course). Also, here's a couple of mine near Breckenridge: http://comtb.com/georgia/index.shtml. For rides near Colorado Springs try http://comtb.com/barr/index.shtml , http://comtb.com/mtbaldy/index.shtml , http://comtb.com/palmer/index.shtml. The Buffalo Creek Mountain Bike Area is not too far out-of-town to the southwest, or try the rides near Golden mentioned above. PEDAL DANCER: Or ride your bike into downtown and enjoy the race with friends. A great big thank you to Kevin from Colorado Mountain Biking (www.comtb.com), thanks for contributing to the fan's experience at the 2012 USA Pro Cycling Challenge. Related reading: Mark, a reader, recently sent in this link and related his story ... "I just finished hiking the Colorado Trail (woo!). While hiking, the Colorado Trail Race (mountain bike) was going on, and I had the occasion to chit chat with the winner for a few minutes. His name is Jefe Branham. Surprisingly, not much has been written about his incredible achievement, especially given that he set the course record."